Advantages & Disadvantages of Apple Music: Is It Worth Subscribing? Under the steep competition of streaming music services, Apple Music has survived and hit its stride. The year-old Apple Music already boasts more than 40 million paying subscribers, which is a nightmare for Spotify, Pandora and other streaming music services. As a new comer compared with Spotify, Apple Music has achieved a great result. So, why are so many people willing to choose Apple Music? Is Apple Music the best music streaming service in the market? Let's take a look to explore the likes and dislikes of Apple Music. What is Apple Music? To quota what Apple's CEO Tim Cook said, "All the ways you love music. All in one place." Simply speaking, Apple Music is a music streaming service which offers you huge catalogs to let you enjoying music more freely and conveniently. It is the combination of three distinct things – Apple Music, Apple Music Radio and Apple Music Connect. The year-old Apple Music has gained much popularity. There music be something which lets people choose Apple Music. Following, the main advantages of Apple Music will be listed. 1. Price and Availability: Everyone gets a three-month free trial to give Apple Music a shot. After 3 months, $10 a month is needed to use Apple Music. This doesn't sound very appealing. But the $14.99 family plan which allows up to six accounts aggressively courts parents. And, this time Apple is smart to be making Apple Music available not only on iOS, Mac, and Apple Watch but on Android phones and Windows PCs. The Apple Music is available in 114 countries, opposed to 60 for Spotify. 2. Huge Music Catalog yet Easy Music Discovering: There are over 40 million songs in Apple Music catalog. You can find almost all music you want in Apple Music. With such a sum of songs, many people would wonder how to find the one they want. Don’t worry, the "For You" section of the app gets to know your preferences and generates recommendations from experts who know and love music based on what you normally listen to. 3. Offline Listening: Paid Apple Music users will have access to download albums and songs they like for offline listening. This helps much to listen to music without Internet connection on the road. Enjoying music on a flight or a trip seems easy to realize. 4. Beats1 Radio: Apple Music allows users tune into Beats 1, an exclusive, 24-7, human-run global radio station broadcasting to 100 countries, which helps those who don't know what to search for and listen to discover artists they can then stream at their leisure. 5. Connect between Musicians and Fans: Apple includes a tab inside Apple Music, named Connect, where artists can share a feed of lyrics, music, photos, videos, and text posts with their fans. It is designed to consolidate and develop the relationship between musicians and fans. 1. Cluttered and Confusing Interface: The overwhelmingly messy design makes Apple Music bizarrely un Apple-like. Many of the screens are cluttered and confusing. It is a million miles away from the design philosophy that built iOS. It seems imperative for Apple to set for interface makeover. Apple's design chief Jony Ive is rumored to have contributed ideas to the makeover, which is scheduled to be unveiled at WWDC 2016. 2. 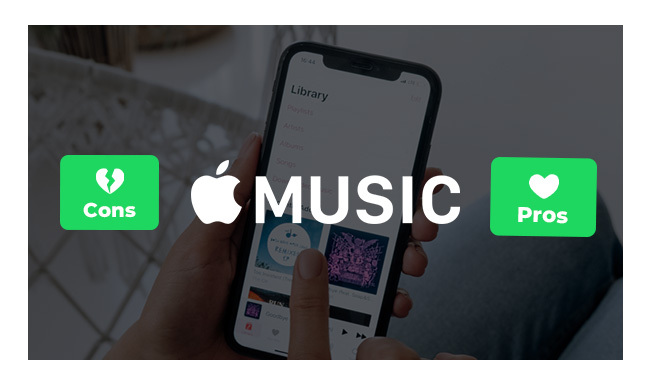 No Free/Ad-Supported Tier: Unlike Spotify, which offers limited free ad-supported tier, Apple Music is lack of ad-supported tier. This makes some people subconsciously make Spotify as their choice. But it is those people who finally turn into paying subscriber. So, It is necessary for Apple Music to offer ad-supported tier. 3. DRM Protected Songs: Apple Music has locked all your downloaded songs with Apple FariPlay DRM, which makes it inconvenient to enjoy these songs. You cannot keep your downloaded songs if you cancelling subscription. Also, you are not able to play the music on devices without Apple ID signed in. The DRM brings many restrictions on Apple Music, which will let you down. Apple Music is an adequate music streaming service. The product isn’t much better or worse than its competitors. On this premise, if Apple Music offers a free tier and standout product innovations, it could leapfrog Spotify, Pandora and Tidal, etc. ♥ Get Better Apple Music in future: While the 2015 launch of Apple Music was marred by a clunky UI and any number of usability issues, Apple’s music streaming service has improved considerably since then. Better recommendations, more personalized playlists, nicer Crossfade and so on, all these improvment contribute a great share in the rapid growth of Apple Music subscribers. ♥ Get Better Apple Music by Removing DRM: To free Apple Music downloaded songs from any limitation, we suggest you remove DRM from Apple Music songs. You can try NoteBurner iTunes DRM Audio Converter which serves as Apple Music DRM Removal as well as Apple Music to MP3 Converter. With this powerful DRM removal, you can enjoy your downloaded Apple Music tracks in any devices or burn the Apple Music songs to CD for enjoying in car player. You can download this powerful Apple Music Converter to have a try, both Windows version and Mac version are available to download.